As earlier mentioned, latex is an ethical material, obtained by tapping rubber trees for their sap. This process doesn’t cause any long term or harmful effects on the tree, thus making it a highly sustainable resource. No animals are harmed while harvesting rubber and no pesticides or herbicides are used in its cultivation, making this product free from harmful toxins. Harvesting latex doesn’t kill the trees as the incision where the sap drains from heals quite easily and quickly, meaning latex can be harvested indefinitely. Dunlop Latex offers extreme comfort. 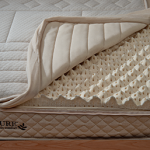 Another major benefit of latex as a mattress material is that it offers different levels of firmness and does not pack down, unlike other materials that easily wear down with continued use. 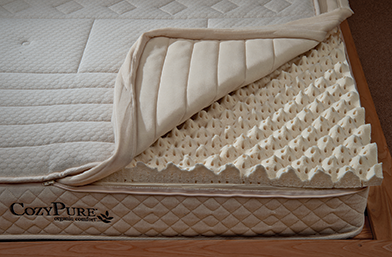 Typical mattress fillings, for instance, have the tendency to condense over time, reducing comfort and evenness. Latex, on the other hand, retains its original shape and firmness even with prolonged use, making it an extremely supportive and comfortable mattress material. Because it is dense, it allows great support, while also providing a fast recovery/springy quality, thanks to the material being highly elastic. Latex mattresses also isolate motion, which makes them ideal for shared beds. Mattresses made out of natural latex have the ability to absorb movement, thus preventing a motion from the other side of the bed from reaching the other person or causing the bed to cave in, towards the middle. Less transference of motion is the buzzwords here.